In the days of yore, when dinosaurs roamed the earth, televisions were chunky and Donald Trump was just some businessman that nobody took seriously, your first opportunity to talk to a date was when you actually met them in person. Now there's a whole series of verbal hoops you have jump through (and set up) before that happens, and if you aren't availed of a sharp wit and good behavioural perception, it can be hard to tell when you're doing well. Online chat is a minefield of potential misinterpretation and anxiety. You can say one thing and have it mean something else, mistakenly take something the wrong way or run afoul of a whole host of other blunders, and the worst part is you might never even realise it happened. Half the time if you do something to freak out a prospective date, they'll just stop replying; you'll never get to find out exactly what went wrong, if anything actually did. Stressed yet? Well now, say it with me, there's an app for that. 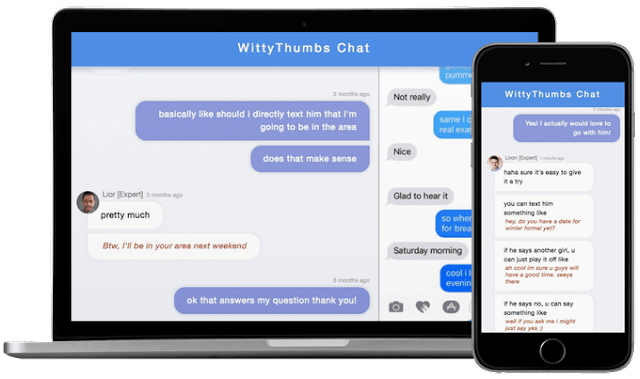 WittyThumbs acts as a kind of translator for dating app speak. To use it, you simply take a screenshot of the chat, and then it's sent across to a community of experts and the other users, who will then read it and try to explain what is really going on. Armed with this information, you'll hopefully be able to turn the words on the screen into a face-to-face encounter, but sadly they won't be able to offer any help on that front, we haven't reached the Black Mirror stage yet. If, however, the advice you get at first isn't doing the job, you can pay a fee for some more in-depth help. $30 nets you 30 minutes of one-on-one chat with a relationship expert, who will talk you through everything until you're in a position where you're confident enough to carry on by yourself. To play devil's advocate, it could be suggested that this is a crutch, and it's better to learn for yourself how to communicate with people without the help of an online community. After all, if you're trying to get on a date with someone and the conversation fizzles, it probably wasn't meant to be. That being said, it does seem unfair and unreasonable that a lack of tone judgement in a medium which makes it so difficult to convey tone is the thing that stymies a potential relationship, so a bit of outside help couldn't hurt, and of course there's no guarantee that the advice you get on WittyThumbs will even yield the desired result. If you're a struggling dating app user who's never managed to translate online chat into IRL chat, this may well be an important game changer.